Dental Implants can provide an ideal solution for the replacement of missing teeth. So whether you are missing a single tooth, a small number of teeth, or all of your teeth, replacing your teeth with the help of dental implants may be the right fit for you and your lifestyle. 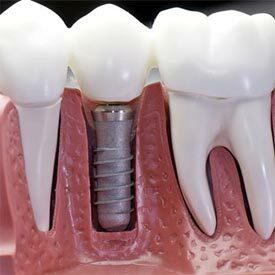 If you are missing a single tooth, a single dental implant can be used to support a crown for tooth replacement. In cases where there are multiple missing teeth, or where a person has dentures, multiple implants can be placed. Depending on the number of implants you receive, you may have replacement teeth that are secure during the day but can still be removed for cleaning and sleeping. Alternatively, implants can be placed such that up to all of a person’s teeth can be replaced with teeth that are not removed. This can be done with anywhere from 4 to 8 implants using Full Arch/Full Mouth or All-on-4® techniques. There is a significant improvement in the overall quality of life for patients who have implant-supported or retained dentures, as opposed to standard or conventional (free-floating) dentures. Implants help maintain or realign facial structure and profile. Implants preserve bone that is otherwise lost when teeth are removed. Implants help to preserve adjacent natural teeth. With an implant-supported crown or bridge, there is no need to cut down adjacent natural teeth in order to hold a traditional bridge or partial denture in place. Traditional removable partial dentures place stress forces on the remaining natural teeth. Dental implants can eliminate the need to stress adjacent teeth to support an implant supported partial denture. Implants help to prevent the appearance of premature aging by preventing bone loss that otherwise occurs after loss of teeth. Patients who wear conventional full dentures often experience difficulty eating, speaking and smiling. Implant-supported replacement teeth can eliminate embarrassing denture slippage. While the initial investment for a dental implant can be greater than that of a conventional bridge, in the long run, implants can be more cost-effective when taking into account the functioning life of the implant compared to a conventional bridge. Dental implants, composed of a titanium alloy which is considered a bio-compatible and bio-active metal, are used to replace the roots of missing teeth. The bio-compatibility process, known as osseointegration, is vital to many operations such as hip or knee replacement. Precursors to today’s dental implants were developed as early as the 1930’s, with modern titanium implant design achieving mainstream success in the 1960’s and 1970’s. With proper care, good dental hygiene, and a healthy lifestyle, implants can last a lifetime. For more than 40 years, dental professionals have successfully placed millions of implants. Technology and procedures have advanced significantly since the first implants were introduced, allowing a well-established success rate of up to 98%. This does imply that at rare times, implants may not be successful. Some reasons for failure can be attributed to an unhealthy lifestyle (smoking), poor dental hygiene, trauma, or infection arising from elsewhere in the mouth. Implants do require brushing, flossing, and regular cleaning appointments with your dentist or dental hygienist. Lastly, the prosthetic teeth can wear out over time, with materials such as porcelain eventually chipping or cracking and requiring repair or replacement. In most cases, the original dental implant can still be used to secure new replacement teeth. Call Cornerstone Dental at (403) 995-1800 to request your Dental Implants appointment today.